If you aren’t big into the Social scene this may be a bit shocking for you to hear, but people are actually talking about Myspace again. The once gigantic social network dwindled under the ownership of Rupert Murdoch’s Newscorp, but was recently purchased by singer turned actor Justin Timberlake who’s team has announced plans to re-brand the site as an entertainment-based social network designed to connect fans to content producers. 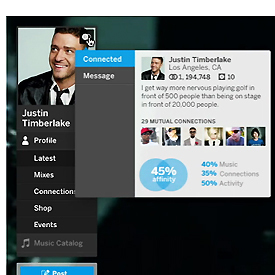 In late September the Myspace home page added a link to a video showing off the site’s new features that ended with a nebulous “coming soon”. Social Media sites went nuts over the video and SM junkies like myself immediately signed up for the invite list. The web was getting all geared up for what appeared to be an exciting new hybrid of Tumblr, Pinterest, Spotify and the original Myspace. Nothing happened though. It’s December and the beta invites are just rolling out, though its an extremely rough beta with a lot of freezing and crashing. We’ve been starved of the functional content Myspace ambitiously promised almost three months ago. This is what I’m calling “The New Myspace Dilemma”, another symptom of the bubble we’ve built around the Social Media industry. There’s an ongoing push for ultra-fast innovation, but nothing has proven substantial enough to satisfy everyone. Industry leaders announce what they believe the next big thing will be and then when it fails to catch they move on rather than supporting an idea to full maturity. See Highlight and the geo-social craze started this year at SXSW, which has failed to catch on in many markets. “The New Myspace Dilemma” comes from this incessant buzz building; but its main symptom isn’t lack of support, its lack of content. Myspace put out the announcement of their relaunch far too early without even a beta version to back it up , and so when a month or so went by with no developments people began to write the idea off. And now, though the beta is visually appealing it still has a lot of functionality issues that should probably have been solved even before the announcement. They’re losing momentum before the race has even started. If you’re trying out the beta version of the site as well you can connect with me here.